Owen Wood is a sought after knifemaker. Few of his knives are seen for long on the web. They have proven to be a good investment and keep appreciating. For his Art Deco engraver, he uses Amayak Stepanyan, who learned his engraving craft in Russia before immigrating to the US. He carves, like no other engraver, deep Deco relief and stippling into the steel of Woodâ€™s handle. Gold Titanium liners. Mother-of-Pearl hinge decor. 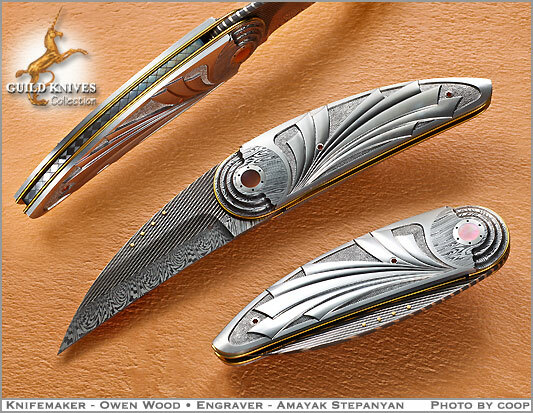 The blade of Owenâ€™s two-bar pin-stripe and explosion Damascus has Gold dot nail tabs.